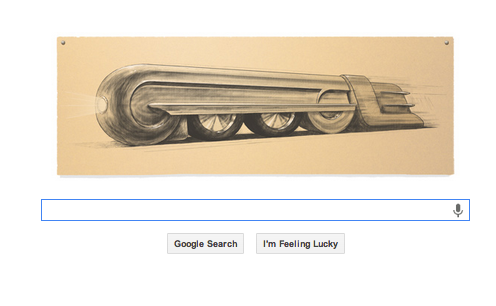 You may have noticed the sepia-toned Google doodle today and clicked through to find out it’s a train designed by midcentury industrial designer Raymond Loewy, whose 120th birthday would've been today. Even if you don’t know Loewy, I can almost guarantee you’ve come in contact with his work—which decorates everything from the Coke Bottle to Air Force One. Historians often talk about Loewy as the designer of the modern world, thanks to objects like the Coke bottle and Lucky Strike pack—but that's just the beginning. His reach extended from one of IBM’s card punchers to three massive cargo ships, from sewing machines to NASA habitats. 1937: The T-1 Locomotive Pennsylvania Railroad. Image via the Library of Congress. Loewy worked in time before the term “industrial designer” had even entered the public lexicon. But by the time he left, it was a whole profession, with its own trade associations and education curriculum. He had appeared on the cover of TIME magazine and worked for everyone from Howard Hughes to JFK. Paris-born, New York-based Loewy was incredibly prolific, to say the least; isolate his designs in, say, transit, and you’d still be left with a massive body of work. But imagine that for not only train, plane, and automobile design, but also graphic and product design, and even aerospace engineering. 1951: Lucky Strike packaging. Image by Matchblog. He was a brilliant designer—but he was also in the right place at the right time. His career was inextricably bound to the post-War economic boom: From early jobs as a department store display designer, to his work on aircraft interiors at the dawn of commercial aviation, to his car designs in the 1940s and 50s—which helped sell the dream of individual car ownership to Americans. 1939: The Pennsylvania Railroad S-1. "Standing somewhere between New York and Philadelphia, I don't know where, and seeing that engine come at high speed, shaking the ground," Loewy later remembered. "It was a thrill, unforgettable. There are great the great moments in a man's life." 1951: Greyhound Bus logo and cabin design. Image by Go Greyhound! 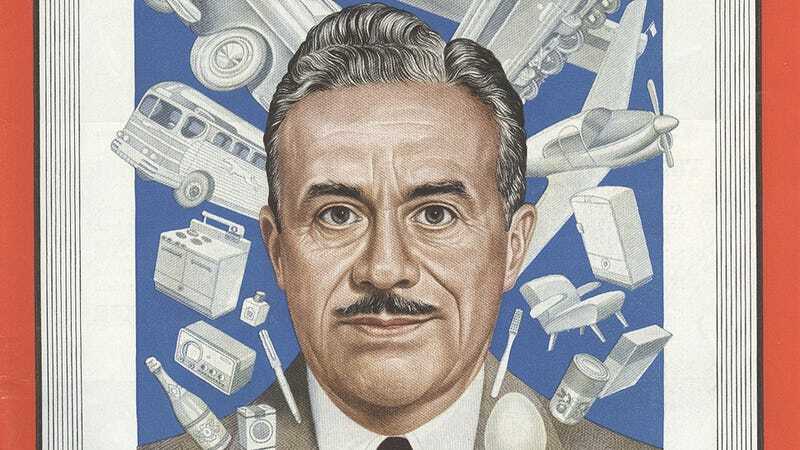 But what's really interesting—and admirable—isn't how famous Loewy has become, or how influential his work was. It's that he was happy to try his hand at anything and everything. He saw the modern world as a magical and interconnected series of phenomena, each in need of careful engineering. Loewy wasn't myopically absorbed in a particular brand or device, and he didn't have a "house" style the way many designers do today. "There is a frantic race to merchandise tinsel and trash under the guise of 'modernism,'" he once said. "I can claim to have made the daily life of the 20th Century more beautiful." 1955: The Coke bottle. "It's shape is aggressively female, a quality that in merchandise, as in life, sometime transcends functionalism," Loewy said. 1961: Preliminary studies for the Studebaker Avanti. "We know that logic alone does not sell automobiles, so its immediate appeal is emotional," Loewy once said of car design. "Sheer elegance and design finesse, the wish to feel its slender curves, to love that car, to be known as its discriminating owner." 1962: Union News restaurants coffee shop at the TWA Flight Center. 1962: Air Force One livery design. Image by U.S. Air Force. 1964: JFK Postage stamp. "For our appointment, I brought along sheets of colored paper, scissors, razor blades and rubber cement," Loewy recalled of his work with JFK. "Since his desk at the Oval Office was relatively small, we just sat on the floor cutting out colored paper shapes and working out various ideas." 1965: DF-2000 cabinets. Image by Dwell. 1968: The Elna Lotus sewing machine, now in MoMA's collection. 1970: The United States Postal Service logo.